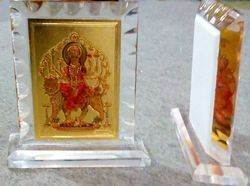 We are offering Acrylic frames with the Differnt Gold Plated Religious Pictures. The pictures are made using laser-cutting technology. Our trained & experienced artisans, executing the exclusive ideas, create these art pieces. Under our product gamut, we have assorted God Pictures, Picture Frames & Advertising Calendars, Glass Cutters, etc. in order to provide our valued customers perfect solutions for their distinguished needs inclusive of interiors, personal or commercial. 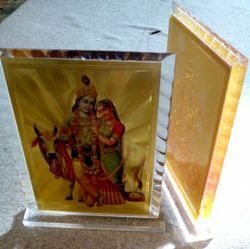 We are offering Gold Plated Yantras with the Differnt Gold Plated Yantras Pictures. Picture Sizes available: 3.5x3.5" & 6x6". 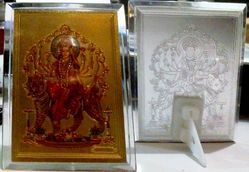 Price gioven for 3.5"x3.5" Size yantras.The pictures are made using laser-cutting technology. Looking for Acrylic Frames With Gold Plated Pictures ?